Best ball fantasy football, for our purposes, is an accumulation of individual statistics we put together to make a team. Whatever value chemistry and teamwork have in real football, we only care about as they go in to making our player put up his numbers. That all said, the players themselves are on teams, and on a given team, there are only so many points to go around. Todd Gurley can be great, but on the 2015 Rams he was capped by the middling players around him. As the Rams got better, his ceiling raised. So (and this is probably obvious), when choosing fantasy options for best ball, you have no choice but to consider a player’s team. Player A might get 35% of his team’s production compared to 25% for Player B, but if Player B’s team is putting up 500 more points than Player A’s, well, you still want B. With that in mind, I enjoy looking at fantasy production on a teamwide basis (offensive players only, no kickers or defenses). And with an eye ahead, it’s worth looking at teams most likely to change in the year to come. One of the ways to identify that is to look at teams that changed the most the year before. 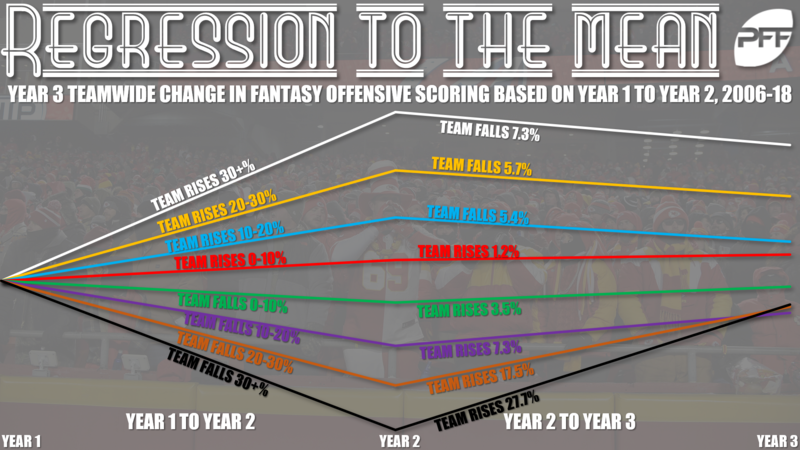 In other words, by and large, if a team rises by a lot from Year 1 to Year 2, it is exceptionally likely to drop in Year 3. And the opposite is true as well. Since 2006, 21 teams have seen their teamwide PPR point total drop by at least 20% from one year to the next. Of those 21, 19 have risen back the next year. The two exceptions: The 2006-2007 Rams fell off by 21%, then fell by another 10.5% the next year, and the 2014-2015 Broncos dropped 21.6% and then another 6.1%. Of 65 teams that have dropped by at least 10%, 50 have risen the next year. It’s not conclusive, but if a team drops off significantly from one year to the next, the odds are very good they’ll rise the year after. The odds are good enough, at least, that we can — in fact, below this we will — identify teams most likely to increase their point total in 2019 by identifying the ones who decreased the most in 2018. 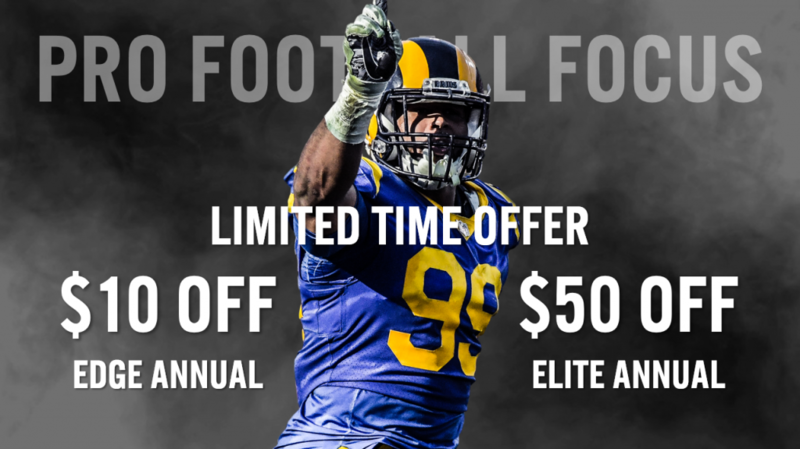 We’re doing this now, ahead of free agency, for two reasons: First, it will be a boon to best ball drafts, which are taking place right now and will be all offseason. And second, it will allow us to look at the teams independent of what moves they make this offseason. Those matter, yes, but math says they don’t matter as much as you might expect. Below are those teams that are climbing the most. Tuesday, we’ll be back to look at the opposite — the teams who increased the most in production from 2017 to 2018 and are likely due for a decline in 2019. And one more caveat — 2018 was big for offense. As such, only nine teams saw their fantasy production drop at all from 2017, let alone more than 10%. So the threshold for inclusion here will be lower than it typically is, and lower than it will be for teams that improved in 2018. Carson Palmer retired. Bruce Arians sort-of retired. John and Jaron Brown left as free agents. The Cardinals had PFF’s second-highest-graded offense in 2015, 15th in 2016, then 32nd each of the last two years. 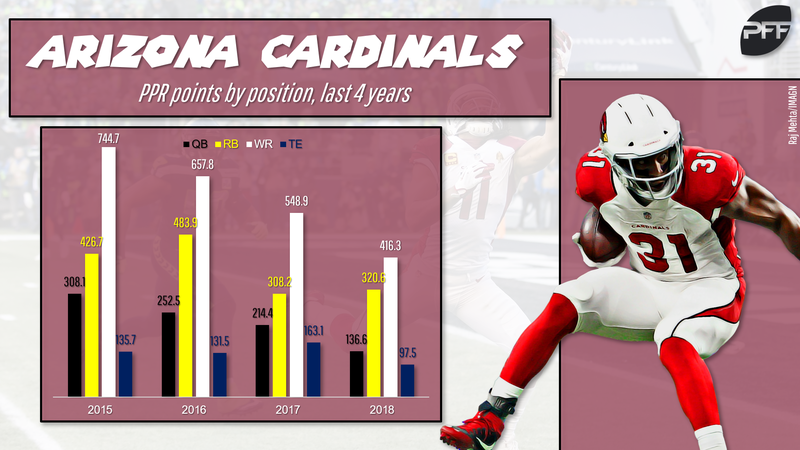 The return of David Johnson from injury helped the Cardinals’ running game a bit, but a disastrous offensive line and poor play from Sam Bradford and Josh Rosen doomed the overall team from the start. How could it improve? Kliff Kingsbury is around as head coach now, and for all the faults he may or may not have, he’s going to do his level best on that offense and he’s at least creative. The Cardinals have already been active this offseason — they’ve only added TE Charles Clay on the offensive side, but they’ve signed more players than any other team and re-upped Larry Fitzgerald — and with the first pick in the draft among their weapons, there’s every reason to expect the team to climb from worst-offense-in-the-league to, well, not great, but not that. The Jaguars haven’t really gotten much from their pass-catchers since 2015, when Blake Bortles’ one monster season led to big numbers from Allens Hurns and Robinson. It was a team in 2017 that built its success on a great defense, a workhorse running back, and Bortles being just not quite bad enough to hurt them. In 2018? The defense wasn’t as good, Leonard Fournette really wasn’t as good, and Bortles was … well, Bortles. How could it improve? Bortles can’t possibly be the team’s starter again, and he isn’t really expected to be. They’ll bring in someone, and whether it’s Ryan Fitzpatrick or Nick Foles or Josh McCown or a rookie, the new quarterback’s absolute floor will be about what Bortles has been. So at that point, all the Jaguars would need is for Fournette to bounce back at all. In other words, the team is almost certain to improve in 2019, and if it gets a good quarterback performance, there’s room for that improvement to be significant. Nobody really thought Alex Smith would equal his heights in 2017, when he finished the season as a career-best QB4, but it’s also true that nobody really thought he’d put up a 14.5-point average fantasy total that was his worst since his San Francisco days. And nobody really thought he’d get injured in such a way that his very career could be in jeopardy. The team put more players on IR in 2018 than any other, saw their flashy rookie running back tear his ACL before the season, and ended the year with a starting quarterback who hadn’t thrown an NFL pass in seven years. How could it improve? TBD, really. We don’t know who will be the quarterback in 2019. We don’t know who will be the offensive linemen. We don’t know if Jordan Reed will be healthy, if Derrius Guice will be healthy, if the wide receivers will do much. Working in Washington’s favor are math and the fact that the team basically has to be healthier in 2019, but there aren’t many bigger question marks than this franchise right now. The golden era of Peyton Manning left after 2014-2015. The golden era of Demaryius Thomas and Emmanuel Sanders ended more slowly, but now, with Thomas recovering from a torn Achilles and a free agent, and Sanders recovering from a torn Achilles and a question mark whether he’ll make it back in 2019 at all, that era is well and truly over as well. The Broncos can call Phillip Lindsay a definite success story, and now have Joe Flacco at quarterback (for better or worse), but 2018 was not one they’ll be writing glowing stories about. How could it improve? Flacco could be really good! I mean, anything’s possible. More likely is that one or more of the Broncos’ 2018 rookie receivers (Courtland Sutton, DaeSean Hamilton, Tim Patrick) or a new arrival makes strides, while Lindsay and Royce Freeman make a potent 1-2 combination out of the backfield. The best news is that the Broncos haven’t really had much of an offense since the 2014 Manning season, so any climb will be met with glowing reception. Sam Darnold arrived and wasn’t very good for most of the year (though he was PFF’s second-highest-graded quarterback from Week 14 to the end of the year). Isaiah Crowell arrived and wasn’t very good before getting hurt; Bilal Powell stayed around and wasn’t very good before getting hurt. Robby Anderson was fine, and Chris Herndon was a pleasant surprise, but there just weren’t many weapons for the Jets. How could it improve? 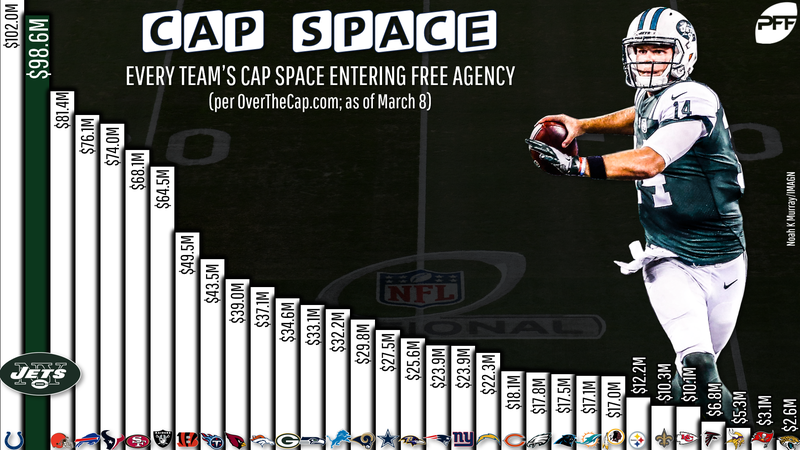 It’s easy to say the possible signing of Le’Veon Bell (the Jets have the second-most cap space in the league) or Darnold’s development would account for this. And they probably will! But the easiest answer is that the Jets don’t have that much improvement to do. They put up 1,202.0 fantasy points in 2017. They put up 1,137.4 in 2018. Even if Bell signs elsewhere and Darnold stalls, just keeping Crowell and Quincy Enunwa and Elijah McGuire healthy should account for the difference.